Warren G. Harding. · One Book. One Author. One Hour. Dean, John W, “Warren G. Harding. ,” One Book. One Author. One Hour., accessed April 21, 2019, http://booknotes.gmu.edu/items/show/679. 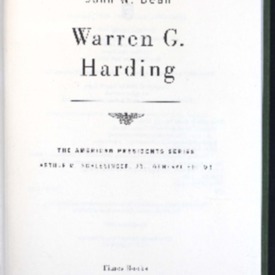 Biography of President Warren G. Harding by John Dean. "Harding, Warren G. (Warren Gamaliel), 1865-1923."